I'm weeks of spasmodic attempts into replacing my old C-drive with a new SSD and a clean install of Win7, 32 bit, so there's a lot of history I will spare people - ask me if there's something you think might be pertinent. 3) I get "Windows Error Recovery" screen, stating "windows did not shut down normally" (white text on black screen), with two options - start normally, or startup repair. a - if I select "start normally,"
it merely returns (after a minute or two) to the same Error Recovery screen after some POSTs (nothing other than single-beep) - no request for my input, no "press any key," etc. b - if I select default ("startup repair") option load: "Windows cannot repair this computer automatically" ultimately results after a lot of attempting to repair, etc. PC will still run OK from old HD when connected, and shows the SSD in Disk Management with a "System Reserved" 100 MB (F) partition along with a 112GB (E) partition. I keep thinking I need to wipe those and try again, but not sure how or if that's even worth trying. What's to be done about this? You get the error screen at the start of the clean install or after you have installed Win 7 and boot for the first time? If after the clean install did you disconnect all other drives before starting the install? Could be the SSD is bad. What make and model SSD? Nothing beyond the steps I listed has happened during any attempt to load Windows for a week or more of sporadic attempts. There's been no opportunity to boot - doesn't install to begin with. Aloha Dave! I miss Hawaii and the Palolo Valley! If you're getting Error Recovery screen it means the OS is attempting to start while the DVD is not booting as it must. 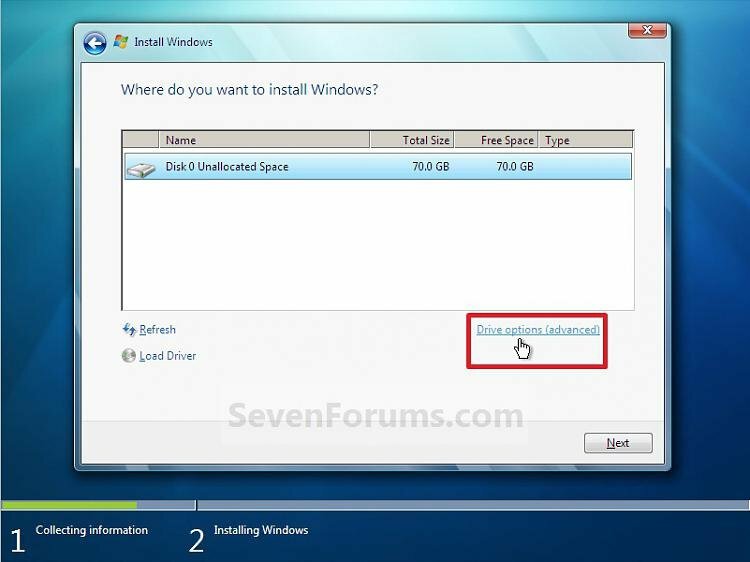 Then follow these steps to Clean Install Windows 7. Greg - mahalos... I miss Manoa, myself. Anyway, I think I am missing key details from your reply. Boot with DVD only? ("have all other HD's unplugged and boot the DVD..."? I think you must have meant with only the new SSD installed, since otherwise there's nothing to install to, right? Undaunted, I tried with NO other HDs connected, to see what would happen. Encouraging thing is that yes, I get through the first few steps of clean installation, until the "Where do you want to install Windows?" screen comes up. Not surprisingly, no drives are listed. Going off-script, I decided to plug the power connector into the recalcitrant SSD at that point and click 'refresh.' It surprised me by not crashing, and showed the same two partitions I can see listed in Disk Management, when I boot up from the old C-drive (100MB system reserved, and 112GB 'primary'). Disk 4 Partition 1: ! The selected partition requires at least 5707 MB free space. This computer's hardware may not support booting to this disk. Ensure that the disk's controller is enables in the computer's BIOS menu. Disk 4 Partition 2: ! Windows cannot be installed to this disk. This computer's hardware may not support booting to this disk. Ensure that the disk's controller is enables in the computer's BIOS menu. Yes I meant to unplug the HD's and leave the SSD plugged in, so that the HD's can't interfere. I would not hot plug your hardware at all - power down first. The warning you read for Clean All command is why I suggested to run Diskpart Clean Command. What I think Greg is saying, and what I think is happening, is that the DVD is not booting the computer. The computer is booting from the SSD, for whatever reason. there is NO way to get the Startup repair screen booting from a 7 install DVD. It just would not give you that screen. I think your DVD is bad. Even if there was no hard drive connected to the system the 7 install DVD should start and load the Base install files into memory. Then give you some type of error that there is no internal hard drive to install to. I assume you changed the BIOS boot order to boot from the CD/DVD reader. Maybe you missed the short message: "Press any key ...". It then reverts trying to boot from the designated disk. Greg - was confused on my end because I'd been doing nothing BUT attempting to boot from DVD with only the SSD connected, many times over days leading up until my post. Maybe that wasn't clear, but whatever - I guess the safer (than hot-plugging) approach would have been to do the "clean" diskpart deal right off. ...after doing a lot of restarting and going through the typical installation process, after the last automatic restart, I had just a black screen, PC running, for five minutes or so. I restarted and pulled out the Win7 DVD, then got the "Windows Error Recovery" screen yet again, and it doesn't boot - goes to the same black screen. WTF? "Even if there was no hard drive connected to the system the 7 install DVD should start and load the Base install files into memory. Then give you some type of error that there is no internal hard drive to install to." I'm confused here - maybe you didn't see what I wrote? What you're describing as evidence that my DVD is NOT working is precisely what I posted as indeed having happened, so clearly the DVD is working. While in BIOS setup set SATA controller (if any) to AHCI mode to try install first. If this continues to hang, then try IDE Mode. Make sure all peripherals are unplugged. Do you have a video card which if necessary you can unplug to default to onboard video chip to try install if it comes to that? reinstalling windows 7 from recovery DVDs or a clean install? Can I Do A Clean Install of Windows 7 From Recovery Disks? 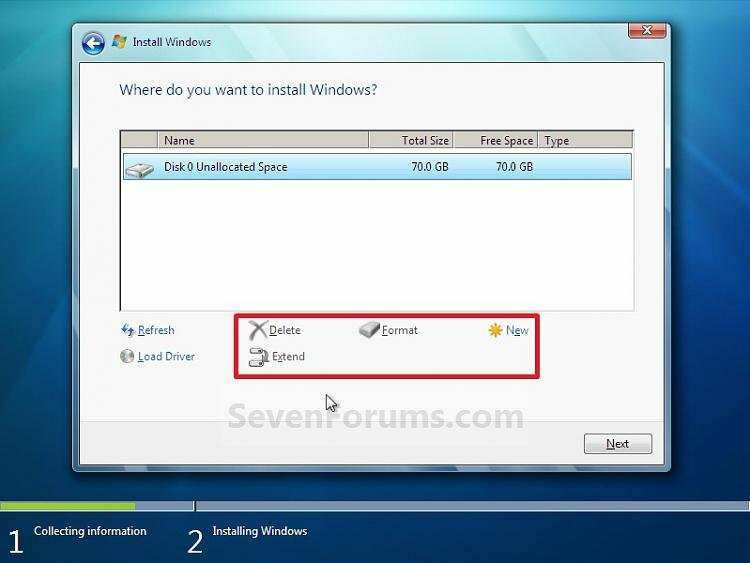 Clean install windows 7 without recovery disks?